Defense Ministry celebrates inaugural event with Lockheed Martin as body of first plane is delivered. The heads of the Defense Ministry delegation to the United States and U.S. military and defense company Lockheed Martin celebrated the near completion of the first F-35 that will become part of the Israeli Air Force. 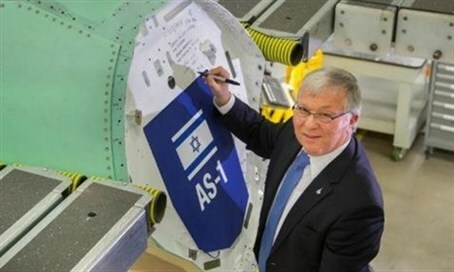 The plane, which is code-named “Adir”, is scheduled to be completed and launched in June. The completion of the outside of the plane allows work on the more important internal systems, including the advanced electronics systems, as well as the incredibly powerful engines to begin. The F-35 is a Joint Strike Fighter jet, which is a fifth generation stealth fighter jet. The Defense Ministry has purchased so far 33 “type A” F-35’s, which allow for regular takeoff and landing procedures. Each plane costs $110 million, bringing the total up to over 3 billion shekel. The purchase deal was originally signed in 2010. The first two planes will land in Israel during 2016, and the Air Force is currently preparations to receive them. The remainder of the planes will be delivered to Israel by the end of the year 2021.